Towpath astronomer Brian Jones points out some of the stars which make up the lion that takes pride of place in the spring night sky. 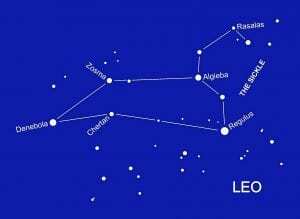 THE constellation of Leo can be seen high up in the southern sky during March evenings and is really unmistakable, being one of the few groups actually resembling the object or character that it depicts. The whole group does indeed resemble a crouching lion, with the conspicuous line of stars extending northwards from Regulus depicting the head, mane and paws. This curve of stars is often known as The Sickle, its overall shape (looking like a backwards question mark) being similar to that of the hand-held agricultural tool with a curved blade typically used for harvesting grain crops. According to Greek mythology, Leo represents the vicious Nemean lion which Hercules slew as the first of his 12 labours, after which conflict the animal was placed in the sky by Jupiter, the king of the gods. Among the many other accounts relating to the constellation is the one which comes down to us from the ancient Egyptians who associated the group with the heat of summer. This was because members of the lion population left the hot desert regions for the cooler areas surrounding the Nile during the summer months, at great inconvenience to the communities living on the banks of the river! Leo is the leading spring constellation and contains more than 100 naked-eye stars, the brightest of which is Regulus, a prominent blue-white object which shines from a distance of around 80 light years. The astronomers of ancient Greece knew this star as ‘The (Little) King’ and the Romans followed suit by referring to the star as Stella Regia, meaning ‘The Royal Star’. An alternative name for Regulus is Cor Leonis, meaning ‘The Lion’s Heart’, a title applied in classical times but rarely used today. Writing in 1552, Willyam Salysbury tells us: “. . . the Lyon’s herte is called of some men the Royall Starre, for they that are borne under it are thought to have a royall nativitie…,” his words clearly indicating the high regard in which this star was once held. Many of the other stars in The Sickle echo the fact that this section of the constellation represents the forequarters of the lion. One of these is Rasalas, which derives its name from the Arabic ra’s al-asad meaning ‘The Lion’s Head’. Rasalas shines from a distance of 125 light years, putting it slightly closer to us than the orange-red Algieba, the light from which set off on its journey towards our planet 130 years ago. Taking its name from the Arabic al-jabha meaning ‘The Forehead’, Algieba has a fainter yellowish companion star which can be seen through a small telescope. 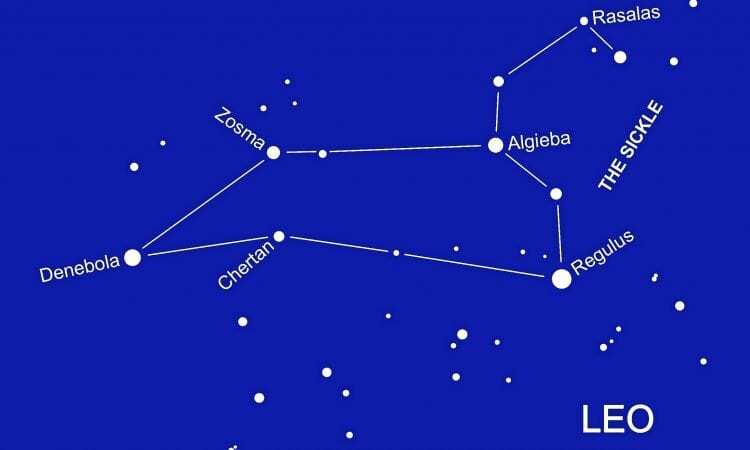 At the opposite end of the constellation to The Sickle is the triangle of stars formed from Denebola, Zosma and Chertan which together form the lion’s hindquarters and tail. Slightly fainter than Regulus, Denebola is a white star whose light has taken 36 years to reach us. It is perhaps no great surprise that Denebola draws its name from the Arabic dhanab al-asad meaning ‘the Lion’s Tail’, representing as it does the tail of the celestial lion. Zosma is named after the Greek for ‘hip’ or ‘lower back’, an appropriate title which reflects its position within the constellation. Zosma shines from a distance of just under 60 light years, which means the light we are seeing today set off on its journey towards us around the time the daily early-morning topical radio show ‘Today’ was first broadcast on the BBC Home Service! Somewhat further away than Denebola and Zosma is Chertan, a star which derives its name from the Arabic al-khurtãn meaning ‘the Two Small Ribs’. Chertan shines from a distance of 165 light years and completes the triangle of stars forming the hindquarters and tail of Leo. So, there we have it. Leo, as the name suggests, takes pride of place among the stars of the spring night sky. In the next Towpath Astronomer we will take a look at the prominent constellation Boötes (the Herdsman), and its leading star, the brilliant Arcturus. Until then, happy stargazing!